Thanks to all! 72 Participants in my dissertation on learning games. Yesterday I interviewed participant number 72 for my dissertation on learning games and Higher Order Thinking Skills. 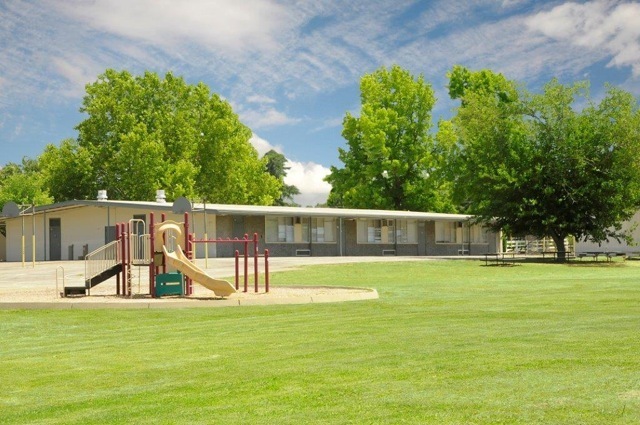 I appreciate all the helpful students at Orangevale Montessori who participated in the research, all the parents who consented to have their children join the study, all the teachers who invited me into their classrooms, and the secretaries and administrators who shared their office space with me. Now, I have much writing to do. “…there is now a wealth of research which shows that video games can be put to educational and therapeutic uses, as well as many studies which reveal how playing video games can improve reaction times and hand-eye co-ordination. For example, research has shown that spatial visualization ability, such as mentally rotating and manipulating two- and three-dimensional objects, improves with video game playing. “Current educational policy in many nations encourage emphases within the school curriculum, particularly important in the second millennium: enhancing thinking as an integral part of the school curriculum, and integrating technology. Future learners should not only acquire a predefined constant knowledge, but higher order thinking abilities, enabling them to intelligently analyze and deal with different situations, solve problems and make decisions. In an age where learning resources are changing, incorporating technology into the curriculum has been found to positively affect the development of higher order thinking skills. Thereof we should examine using technology for teaching (ordering and practicing) thinking to be used in the learners’ everyday lives. WASHINGTON – Playing video games, including violent shooter games, may boost children’s learning, health and social skills, according to a review of research on the positive effects of video game play to be published by the American Psychological Association. The study comes out as debate continues among psychologists and other health professionals regarding the effects of violent media on youth. An APA task force is conducting a comprehensive review of research on violence in video games and interactive media and will release its findings in 2014. The article will be published in APA’s flagship journal, American Psychologist. While one widely held view maintains playing video games is intellectually lazy, such play actually may strengthen a range of cognitive skills such as spatial navigation, reasoning, memory and perception, according to several studies reviewed in the article. This is particularly true for shooter video games that are often violent, the authors said. A 2013 meta-analysis found that playing shooter video games improved a player’s capacity to think about objects in three dimensions, just as well as academic courses to enhance these same skills, according to the study. “This has critical implications for education and career development, as previous research has established the power of spatial skills for achievement in science, technology, engineering and mathematics,” Granic said. This enhanced thinking was not found with playing other types of video games, such as puzzles or role-playing games. Playing video games may also help children develop problem-solving skills, the authors said. The more adolescents reported playing strategic video games, such as role-playing games, the more they improved in problem solving and school grades the following year, according to a long-term study published in 2013. Children’s creativity was also enhanced by playing any kind of video game, including violent games, but not when the children used other forms of technology, such as a computer or cell phone, other research revealed. Simple games that are easy to access and can be played quickly, such as “Angry Birds,” can improve players’ moods, promote relaxation and ward off anxiety, the study said. “If playing video games simply makes people happier, this seems to be a fundamental emotional benefit to consider,” said Granic. The authors also highlighted the possibility that video games are effective tools to learn resilience in the face of failure. By learning to cope with ongoing failures in games, the authors suggest that children build emotional resilience they can rely upon in their everyday lives. Another stereotype the research challenges is the socially isolated gamer. More than 70 percent of gamers play with a friend and millions of people worldwide participate in massive virtual worlds through video games such as “Farmville” and “World of Warcraft,” the article noted. 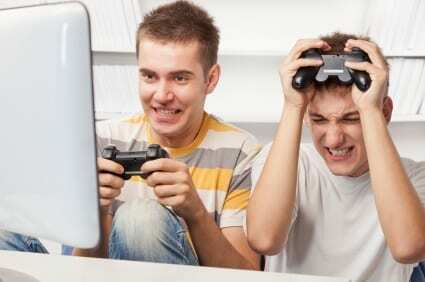 Multiplayer games become virtual social communities, where decisions need to be made quickly about whom to trust or reject and how to lead a group, the authors said. People who play video games, even if they are violent, that encourage cooperation are more likely to be helpful to others while gaming than those who play the same games competitively, a 2011 study found. The article emphasized that educators are currently redesigning classroom experiences, integrating video games that can shift the way the next generation of teachers and students approach learning. Likewise, physicians have begun to use video games to motivate patients to improve their health, the authors said. In the video game “Re-Mission,” child cancer patients can control a tiny robot that shoots cancer cells, overcomes bacterial infections and manages nausea and other barriers to adhering to treatments. A 2008 international study in 34 medical centers found significantly greater adherence to treatment and cancer-related knowledge among children who played “Re-Mission” compared to children who played a different computer game. The authors recommended that teams of psychologists, clinicians and game designers work together to develop approaches to mental health care that integrate video game playing with traditional therapy. Article: “The Benefits of Playing Video Games,” Isabela Granic, PhD, Adam Lobel, PhD, and Rutger C.M.E. Engels, PhD, Radboud University Nijmegen; Nijmegen, The Netherlands; American Psychologist, 2013. Full text of the article is available from the APA Public Affairs Office. The American Psychological Association, in Washington, D.C., is the largest scientific and professional organization representing psychology in the United States. APA’s membership includes more than 134,000 researchers, educators, clinicians, consultants and students. Through its divisions in 54 subfields of psychology and affiliations with 60 state, territorial and Canadian provincial associations, APA works to advance the creation, communication and application of psychological knowledge to benefit society and improve people’s lives. Video games teach empathy – and many other good things! “A growing body of research is showing the flip side, though – video games can help people see better, learn more quickly, develop greater mental focus, become more spatially aware, estimate more accurately, and multitask more effectively. Some video games can even make young people more empathetic, helpful and sharing. As public debate on the subject is often highly emotive and polarised, and as more and more of us are becoming gamers, researchers say it is important to move beyond the generalisations that characterise much of the discussion. Part of this has stemmed from the fact that 20th-Century video gaming research often failed to distinguish between game genres. Studies lumped together the different brain processes involved when racing cars, shooting baddies, street fighting, and completing puzzles. But with the benefit of hindsight, researchers now recognise they hold only limited insights into the impacts of video games. 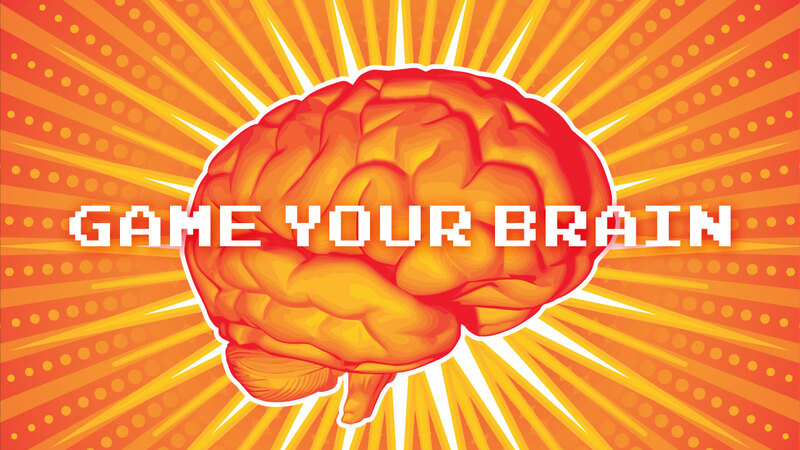 Bavelier stumbled upon the particular effects action games may have on the brain by accident. She was designing a test to probe the effects of congenital deafness on visual attention, and while trialling it a young researcher in her department, Shawn Green, and his friends repeatedly scored far higher than expected. Eventually they realised their exceptional performance could be traced to their fondness for the action games Counter-Strike and Team Fortress Classic. 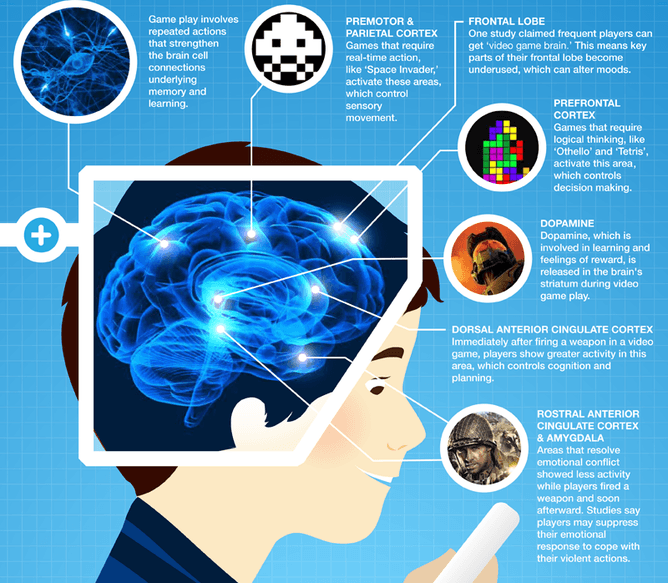 Bavelier and Green hypothesised that this type of game had distinct effects on the brain because achieving a high score requires players to react quickly, while processing information in their peripheral vision, multi-tasking, making predictions and processing the constant player feedback. In research published in 2003, they used a series of visual puzzles to demonstrate that individuals who played action games at least four days per week for a minimum of one hour per day were better than non-gamers at rapidly processing complex information, estimating numbers of objects, controlling where their attention was focused spatially, and switching rapidly between tasks. Was this cause or effect, though? Were the games improving people’s focus or were people with good attentional focus simply more likely to play action video games?, Bavelier and Green asked non-gamers to play the first-person shooter game Medal of Honor for one hour a day for 10 days, and found their ability to focus on environmental cues improved much more than those in a control group who played the classic puzzle game Tetris. Additional tests from other researchers came to similar conclusions. For instance, Joseph Chisholm, a psychologist at the University of British Columbia, Canada, found action video game players were better able to identify distraction and quicker to return their focus to the main task. Bavelier wanted to pin down more precisely why action gamers appear to have better focus. She placed electroencephalography (EEG) headsets on gamers and non-gamers, and asked them to watch a screen on which three rapid sequences of letters appeared simultaneously. They were told to focus on one of the three and press a button when numbers appeared, while ignoring distractions. The EEG headsets tracked electrical signals in the brain, allowing Bevelier to measure how much attention the volunteer was allocating to the task and to the distraction. Gamers and non-gamers were equally able to focus their attention on the target sequences, but the gamers performed better and had quicker reaction times. “The big difference was action video gamers are better at ignoring irrelevant, distracting visual information, and so made better decisions,” she says. Her team has also shown that action gamers may have stronger vision. They can better distinguish between different shades of grey, called contrast sensitivity, which is important when driving at night and in other poor visibility situations, and is affected by ageing and undermined in those with amblyopia, or “lazy eye”. They also have better visual acuity, which is what opticians measure when they ask you to read lines of ever smaller letters from a chart at distance. Bavelier found action video games could also improve the vision of non-gamers. She asked groups of non-gamers to play 50 hours of Unreal Tournament 2004 or Call of Duty 2, or to play the slower, non-action game, The Sims 2, over nine weeks. By the end of the study, the contrast sensitivity of those who trained on action games had improved more than those who played The Sims 2, and the benefits lasted for at least five months. Other researchers at the University of California, Berkeley, showed that adults with lazy eyes who spent 40 hours playing video games with their good eyes patched could improve their ability to distinguish smaller letters on such charts. The higher scores were not seen in those asked to do other visually demanding tasks such as reading and knitting with their good eyes patched. Researchers know from years of studies that when men and women are given the task of rotating two-dimensional and three-dimensional objects in their heads, men tend to perform better than women. When Jing Feng, a psychologist at the University of Toronto, in Canada, and colleagues asked a small group of non-gamers to play either Medal of Honor or the 3D puzzle game Ballance for 10 hours over several sessions, they were surprised by the results. They found the action game training boosted the scores of the female participants more than it did the males, and the effect of the training was still apparent five months later.